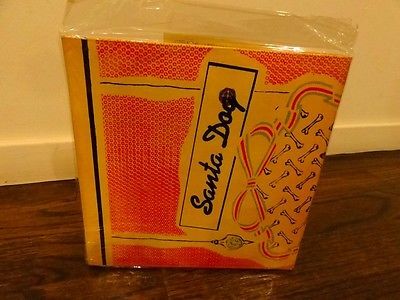 The package was the founding release from Ralph Records and consisted of two 45s in a hand silk-screened gatefold sleeve which was printed to look like a Christmas card from an insurance company. This sleeve included '50s-ish drawings illustrating each song surrounded by text saying "Season's Greetings from Residents Uninc." and announcing the upcoming Vileness Fats project. 500 copies were pressed but only 400 were usable because of various problems. Some of the sets were shrink-wrapped before the varnish on the silk-screening was dry and the packages had to be torn apart to be opened. Of the 400 usable copies, 300 were sent out to friends, record companies, and anyone else who came to mind. Richard Nixon was sent a copy, as was Frank Zappa, whose copy was returned "No Longer At Address" and was later given away in a contest. First official release by the legendary Residents. Quite beyond strange for the time and without comparison back in 1972. Screened gatefold cover has nice screen intact inside and out ( many were stuck together because screen had not yet dried and some became stuck to outer shrink wrap). Group had not even officially adopted the name Residents yet. A truly monumental musical artefact that beat, by many years, punk and Throbbing Gristle to the punch. This is the last part of a very special collection, probably the most definitive in the world, that documents the cult art rock punk band The Residents. There will only be a few leftovers offered after this, so get this stuff while you can! And truth be told, I've saved the best for last… In these offerings you will find test pressings, rare 1st editions, stage props, cassette-only and cd-only releases, books, and other random stuff. It's almost all in pristine condition. If you dig this band, Ralph Records, Negativeland, Snakefinger, Yello, MX-80 Sound or other Third Wave type stuff, you will most certainly want to scour this auction. And save me as a seller, because I get tons of cool stuff! If the shipping calculator gives you a price that seems really wrong, then it is wrong. I haven't quite figured out how to make it work exactly right yet. It doesn't cost $26 to send a pin to Europe. INTERNATIONAL ORDERS PAY ACTUAL SHIPPING COSTS. That includes the postage, the box, and the significant chunk of the postage money that ebay takes for itself. It usually takes me a couple days to pull all of the international orders of multiple items, box them, weigh them, and then send the correct invoice. I appreciate your patience. If your package weighs more than 4 pounds, it must be sent priority mail. SHIPPING IS $5.48 for 1 LP and $6 FOR ANY LARGER QUANTITY OF LPs WITHIN THE USA. I do not sell recent re-issues. All records are vintage, unless I specifically say otherwise. As far as grading, I assume that a sealed record is mint. Check my other stuff! Save me as a seller, as there's always lots more coming! Amazing stuff coming through the pipes! The grading of vinyl and cover are in the item specifics. This is where Ebay likes us to put them now, so you can sort by grading, among other things. I do the very best I can to make everyone happy by grading fairly. I offer hassle-free returns. I don't give partial refunds. If you are unhappy with any aspect of our transaction, please don't take it personally or write a nasty email. Just simply let me know that you will return the item for a refund.